Dhaka, Aug 9 (Just News): Customs official held an Indian citizen with 22 gold bars, weighing 12.3 kilogramme, from Hazrat Shahjalal International Airport early today. The detainee, Arshad Ayaz Ahmed, 46, was held around 1:00am after he got down from Thai Airlines flight no TG339, said Othello Chowdhury, deputy commissioner of customs. 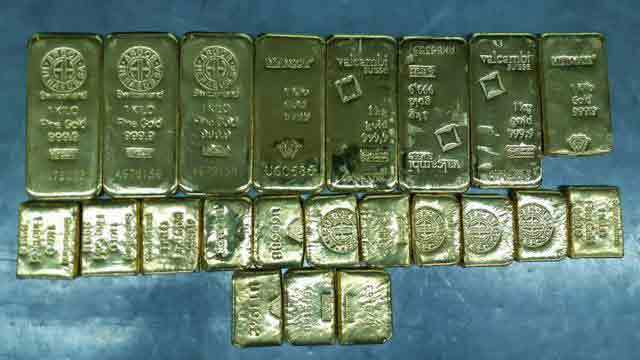 Acting on a tip-off, the preventive team of Dhaka custom searched Ayaz and found the gold bars worth Tk 6.15 crore, the official said. The detainee has been handed over to police and further action will be taken against him according to the Customs Act 1969 and Special Power Act 1974, he said.